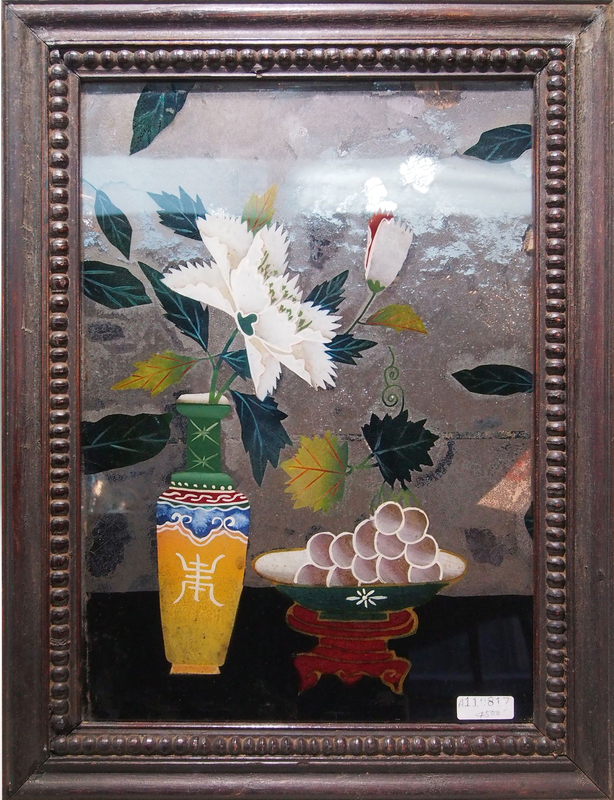 This is a wood block print is a special type of wood block print that is used to decorate the window. Those for the side of the window are generally long, like this one (which is to be cut into 2 long strips). The theme are mostly of the flower with traditional flower vases. 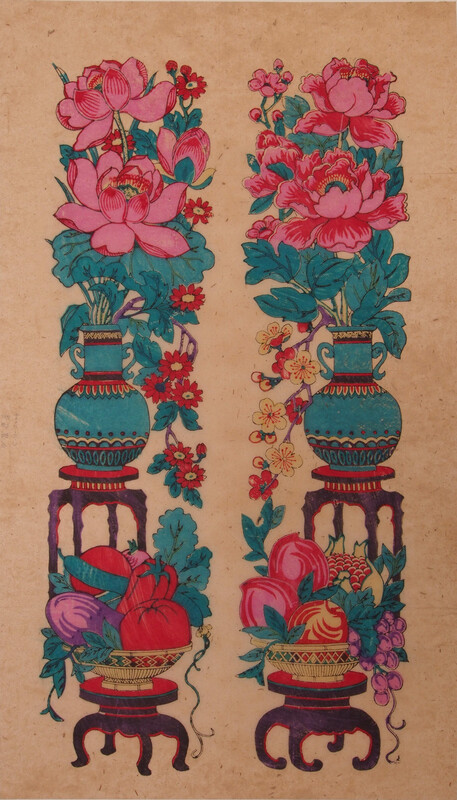 This particular print features the peony and a variety of fruits and vegetables. The one that are placed over the window are horizontal and long, an example of this will be featured in tomorrow’s post. Those placed on the window lattice resembles paper cutouts for the same purpose. 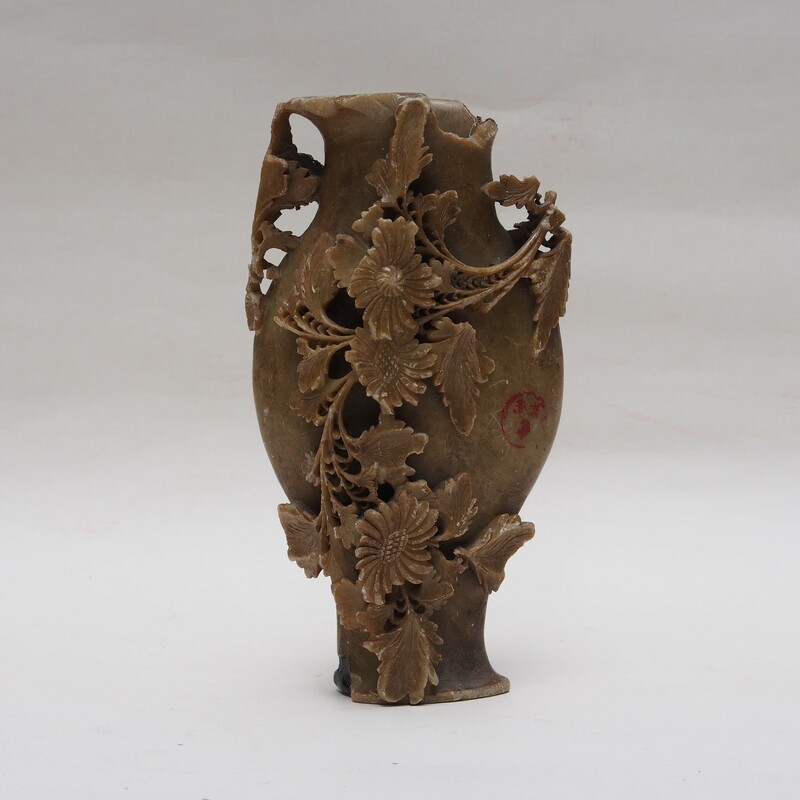 An old stone vase that would have been for the family shrine. A mirror painting of a still life. Though unintentional by the artist, there is something rather modern about the painting; the lack of shadow, the flatten objects, the solid colour, lack of detail and the sharp outline of the objects. Reminded me of Patrick Caulfield’s work. 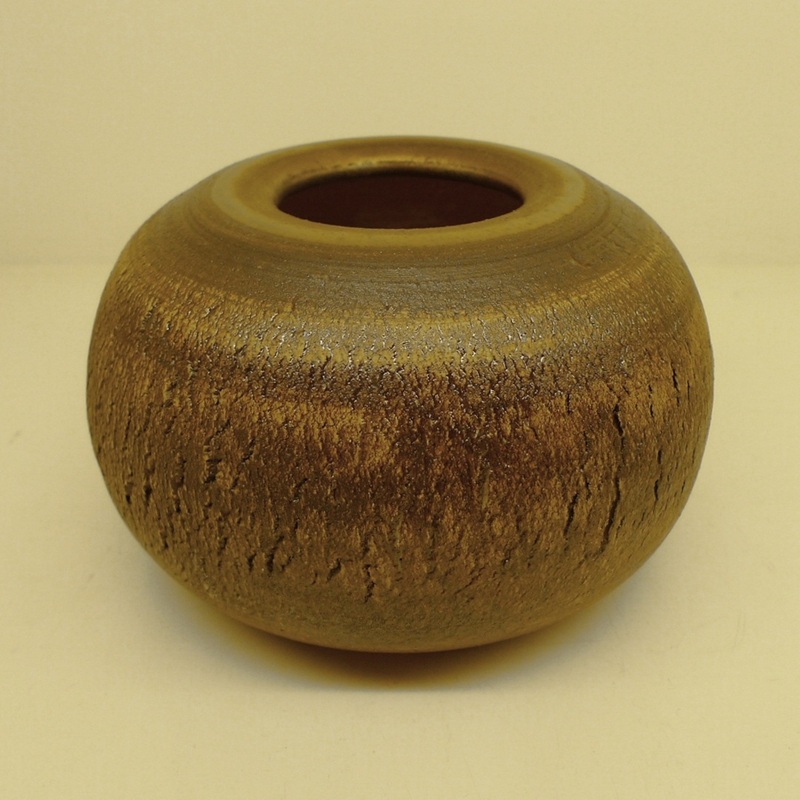 Bronze finished round vase, thrown on wheel, texturized body with metallic wash finish. 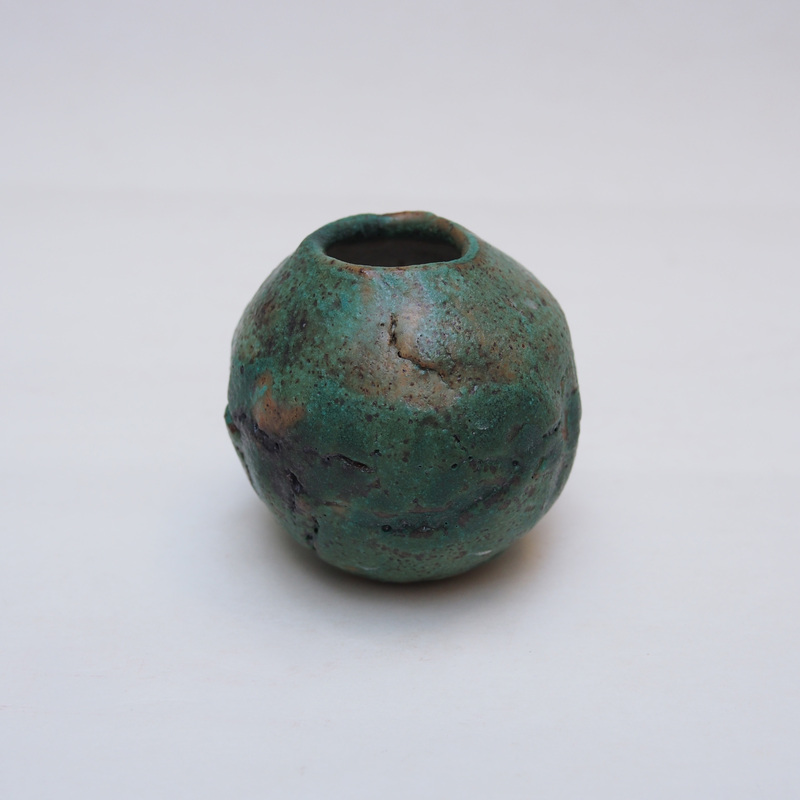 The bronze like glaze effect come from a mixture of copper oxide, manganese dioxide, and iron oxide. William Morris once said among the simple necessities that ought to furnish a room are a vase or two to put flowers in. If you are getting just one vase for your “room” this one will be perfect. And if you already have a collection of vases, this will be a delightful addition. Its shaped made it very easy for arrange for tall stemmed flowers, like the ginger lily (Hedychium coronarium), widely available in the local markets, but under appreciated. 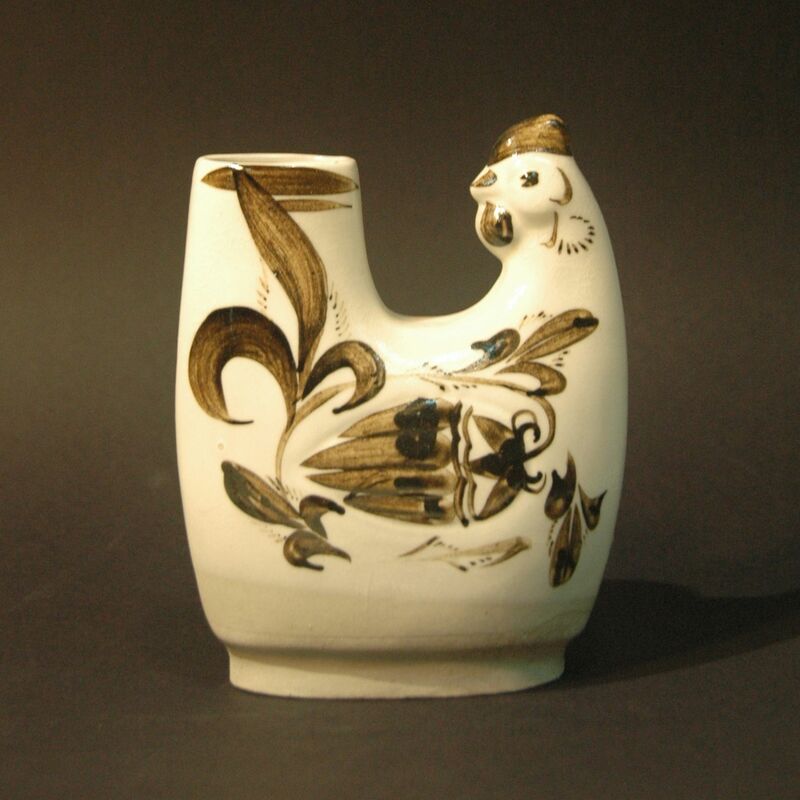 Stoneware body with semi matt cornish stone white glaze and orange underglaze enhancement. Thrown on wheel. 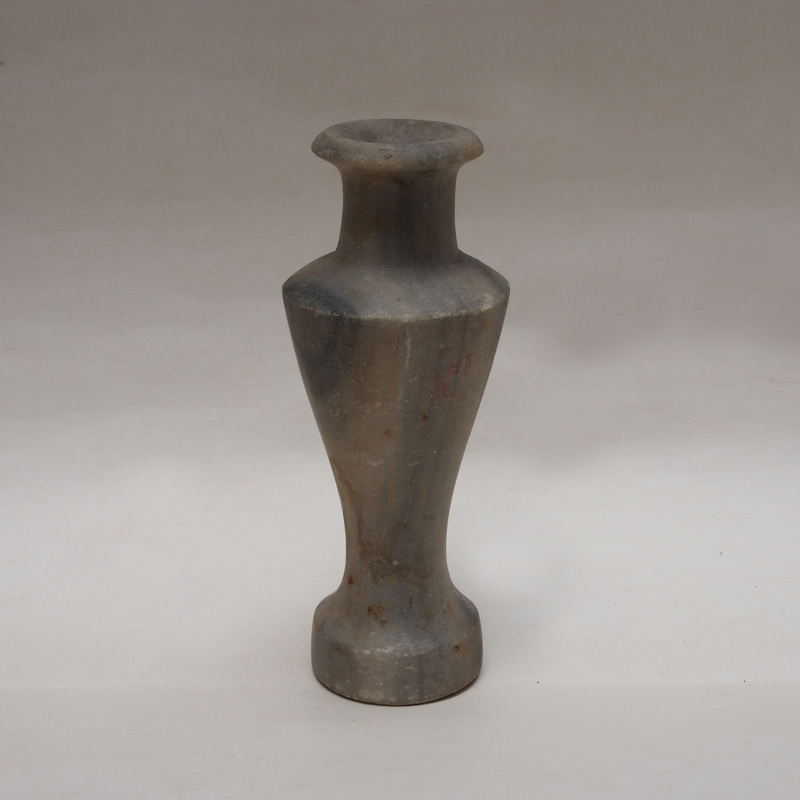 This round bottle is made by Chris Lo, founder of the Cobo Ceramic Workshop. 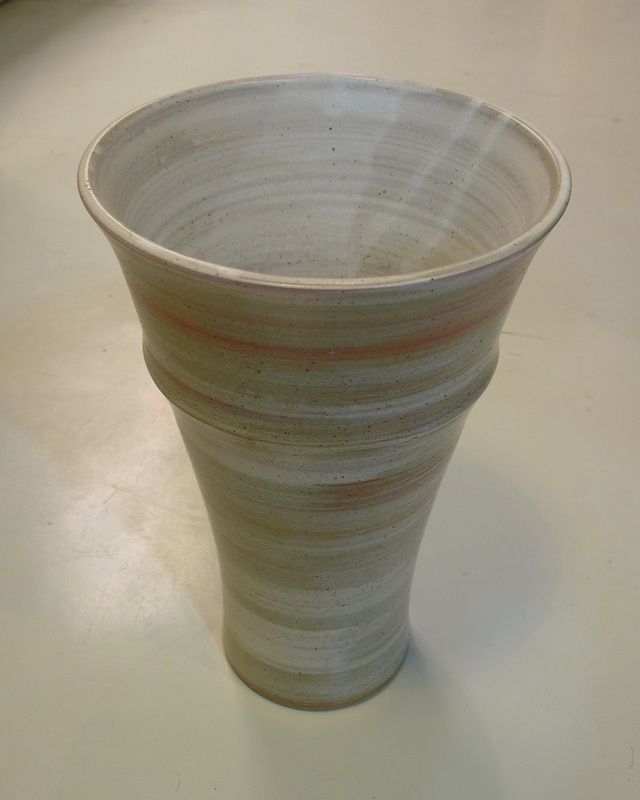 The clay body uses a groggy clay which can stand for the thermo shock created during the raku post reduction firing. 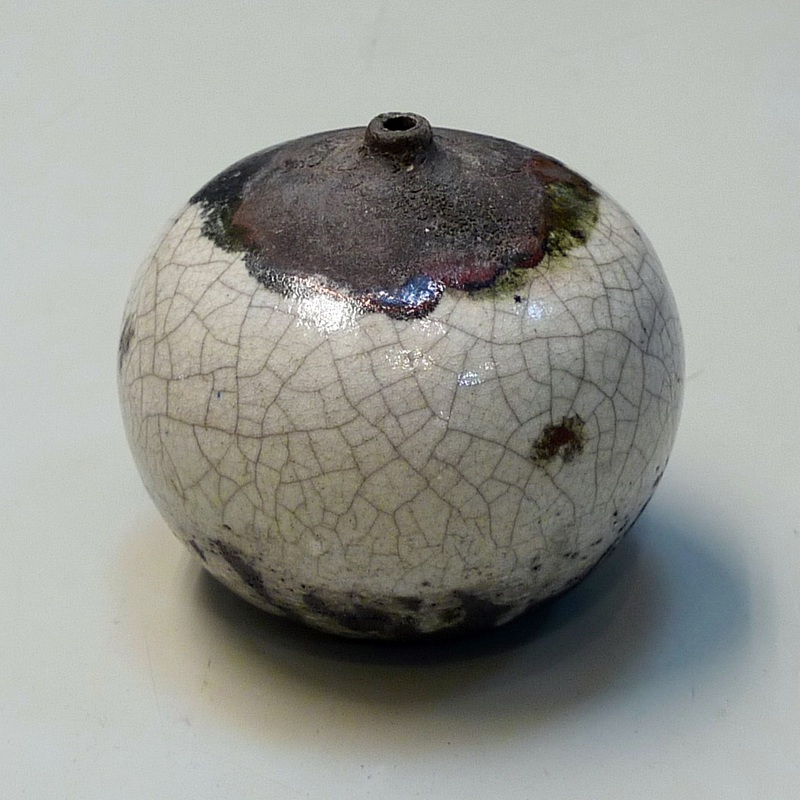 The matte black carbonized surfaces and black crackles are the main characteristic of raku firing. The round shape gives a stable and strong body structure to avoid cracking. Raku was started in Japan by Chojiro in the 16th century; unlike other type of pottery firing where they are loaded into a cold kiln with temperature rinsing slowly, taking anywhere from 8-24 hrs or longer, when the designated temperature is reached the heating is turned off and the contents allow to naturally cool down until they can be removed with bare hands. With raku, the pottery are loaded into a hot kiln where the desired temperature is reached in a much short time, can be as short as 15 mins). The pottery is then removed from the hot kiln with the aids of tongs and put into a container of combustible material (sawdust, leaves, etc) to be smoked, the surface is carbonized reacting with the glaze and the clay giving the unique matt black unglazed clay and crackled glazed surfaces. The Chinese cabbage (Brassica Pekinensis) is a basic vegetable consumed by the whole of China, it is not surprising that it will be come a subject for folkart. 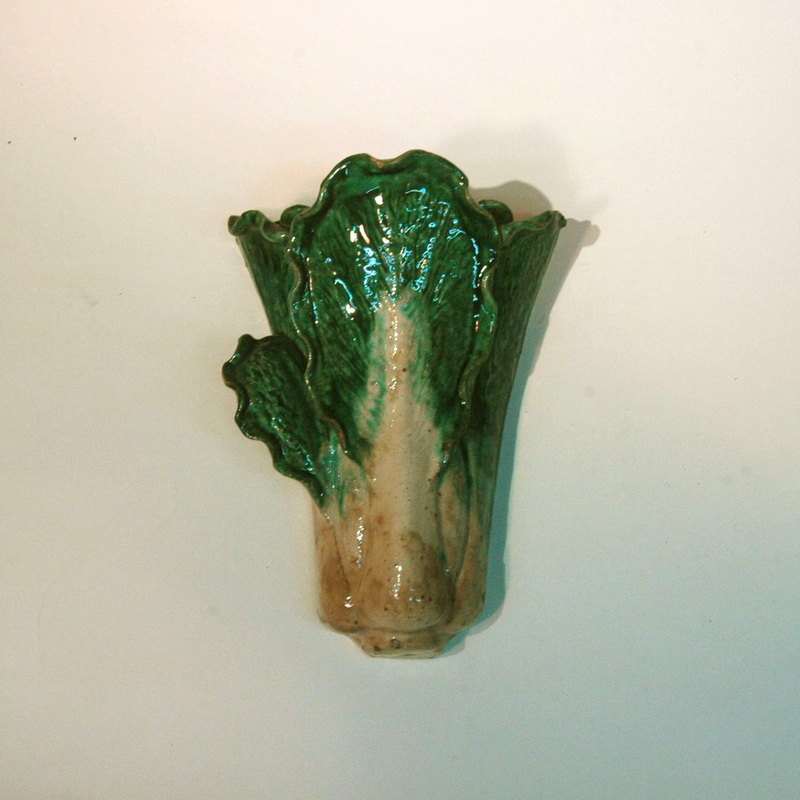 This pottery cabbage is a wall hanging vase. Chinese cabbage has been documented in Chinese history since the San Guo period (220AD), it became a popular vegetable together with the turnip by 600AD.